Expanding its slurry application portfolio, Joskin has added new, larger models to its range of Solodisc disc injectors. Joskin adds three new models of disc injector to its slurry application range. A new design sees three new working width disc injectors added; 6.75m, 7.5m and 8.25m. 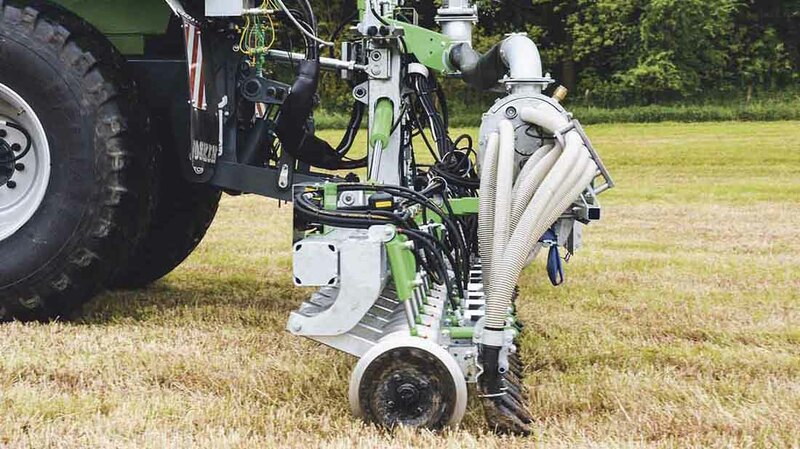 In order to improve the distribution of slurry and enable a shallower working depth, disc spacing is now 18.75cm, reduced from 21.5cm on previous models. Slurry processing is taken care of via Joskin’s own macerators; one for each half of the applicator. As a result, length of hoses can be kept shorter and slurry flows better, says the manufacturer. Comprising a 40cm diameter metal ring with a nitrile rubber centre, disc construction is lighter and said to require less pulling power. Despite more discs, overall weight is said to be lighter compared to previous machines. Working depth can be varied from 1 to 6cm by altering the pressure in the hydraulic rams of the linkage on the injector. Discs are mounted in pairs on a vertically-swinging arm, which can also pivot left and right by 20 degrees, allowing corners to be negotiated. Available as an option, anti-drip pincers lock the injection hoses by means of a return spring and freed off using hydraulic power. Instead of springs as standard, a hydraulic cross compensation system can also be specified which keeps an even amount of ground pressure on each pair of discs regardless of ground contours. Also, hydraulic rams allow independent lifting of each pair of discs to allow for section control, with hoses automatically closed depending on the tanker’s position in the field via GPS.